CatDV has partnered with several archive solution suppliers to compliment its archive to media functions. LTO backup of clips can be accomplished by selecting the clips for backup from catalog and selecting Archive Media Files from the Tools menu. CatDV will then forward these files to the LTO system and update the status of the clips within the catalogue as archived. 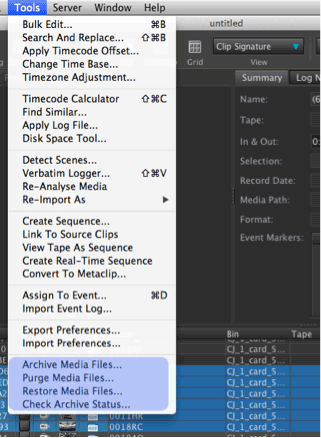 The LTO tape name and location is then added to the clip database. The benefit of archiving using CatDV is that you can keep the low res proxy files on the system giving an excellent feature of reviewing footage long after it has been archived . This footage is fully searchable and can be selected for restore at anytime. Restore the media back by selecting Restore Media from the Tools menu which sends the information to the LTO cart system to retrieve the footage. You can restore the media to the same location or choose a different location in the options for restore menu. Using the worker node you can setup an automated Archive system by using predefined fields within CatDV. On the user marking clips for Archive, CatDV can automatically set to work sending the files for Archive to the LTO device. Once completed the catalog would then automatically be updated with an archived status. The proxy file will still be available to view for future reference but the original media has been purged.